In honor of Earth Day, I decided it would be a good idea to clean out the closet and do some re-purposing. 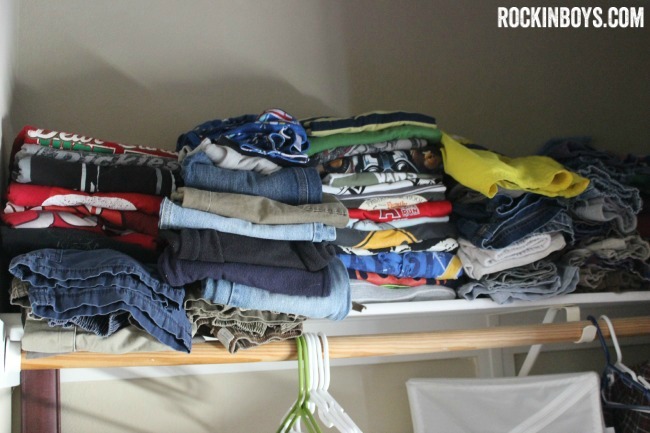 My boys seem to have an overflow of shirts that they don’t wear anymore. They are packing the dresser drawers and stacked up high on the closet shelves. It’s kind of crazy! 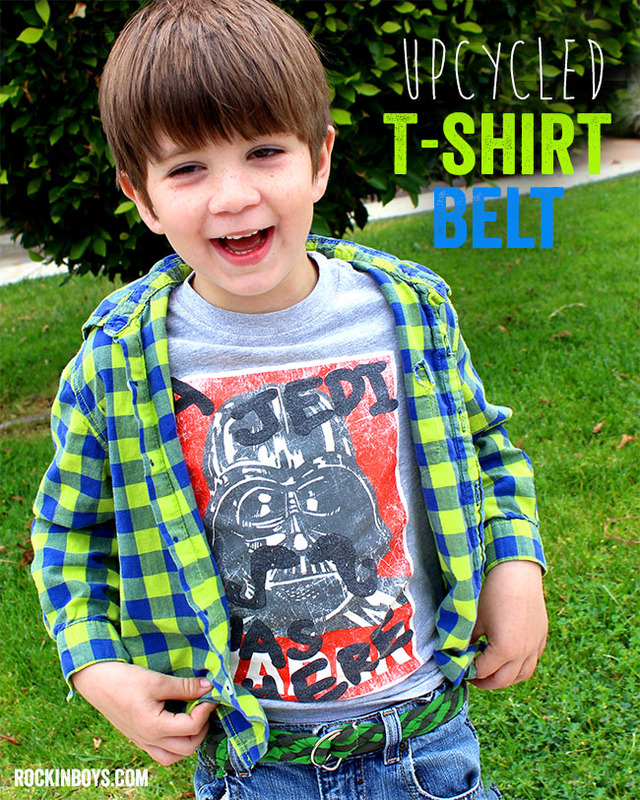 I figured an upcycled t-shirt belt would be a cool project to try. 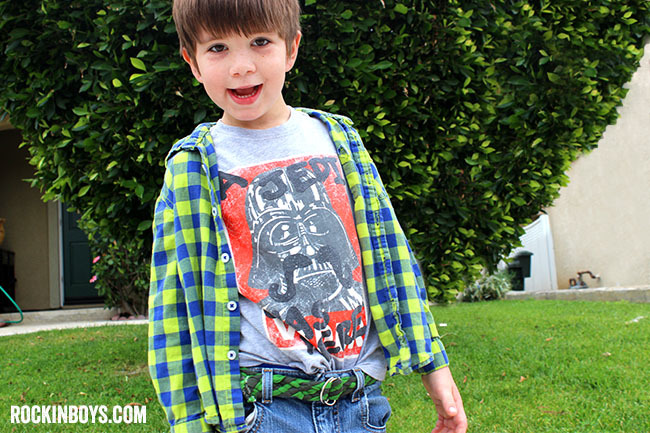 Jackson is super into dressing up and he always wants to have a belt on if there are belt loops on his pants. When looking for shirts, you want to pick ones that have some empty space on the front and back. You don’t want weird blotches throughout your belt. *Bonus tip: use shirts that do not have side seams. 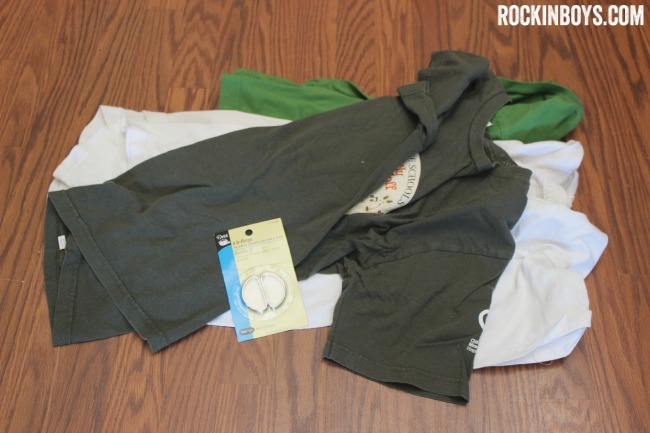 I gathered up some random shirts and Jackson chose the two green ones for his belt. (No surprises there, his favorite color is green!) I also picked up some D-rings at the craft store for a couple of bucks. First you need your T-shirt strips, I recommend this T-shirt “Yarn” Tutorial, but skip the last part and leave the strips flat rather than stretching them. Measure your child’s waist, or yours if you’re making one for yourself, and double it to get the length of your strips. Cut six strips in that length. 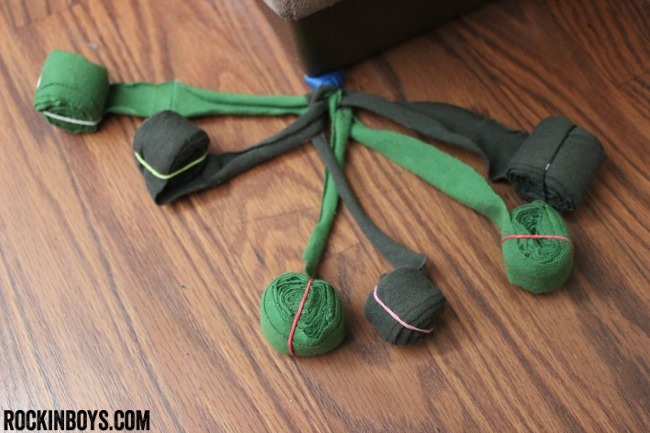 Tie or rubberband them together and place under something heavy. 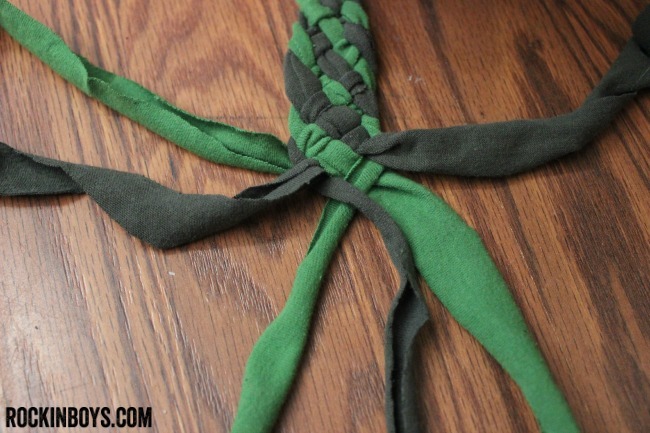 Then arrange them in alternating colors, and roll the strips up and secure with a small rubber band. 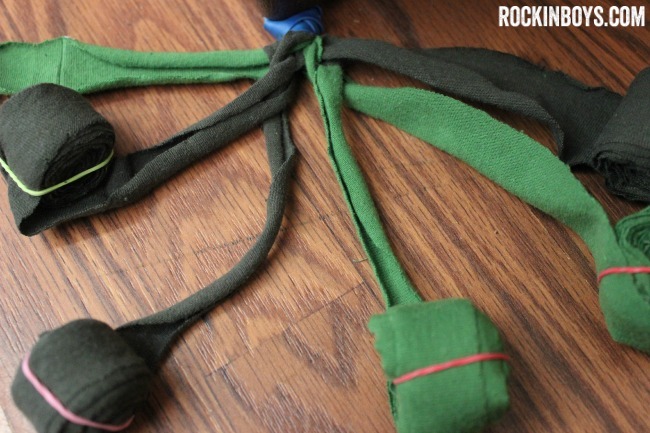 (Great way to use up a few of the million rainbow loom bands you have around the house!) 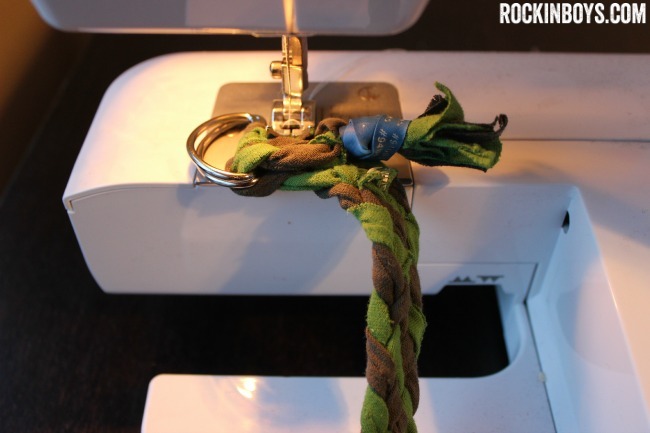 This step is optional but will make the braiding go way more smooth. Now we’re ready to braid. Take the strip all the way on the left and move to the right two spots going over the first and under the second. Then take the strip all the way on the right and move it to the left two spots going under the first and over the second. Remember: Left = Over then Under, Right = Under then Over. Then you cross the left over the right in the middle to finish. Continue going over then under, under then over and cross. Soon you’ll see your pattern. Make sure to pull lightly to tighten and flatten as you go. Unroll your strips a few inches at a time. 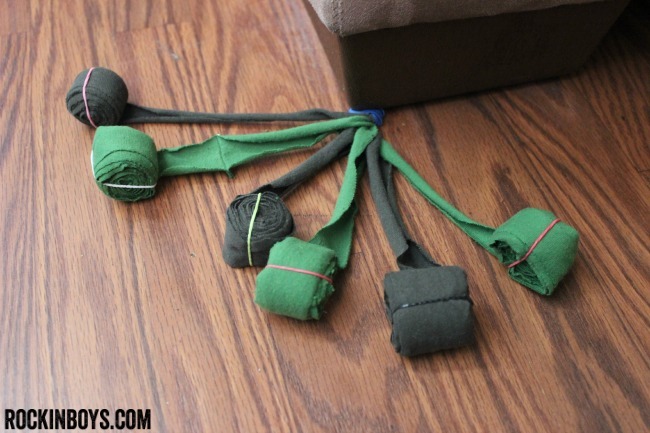 If you unroll too much they’ll get tangled while you braid. Braid until you get to the waist length plus a couple of inches. 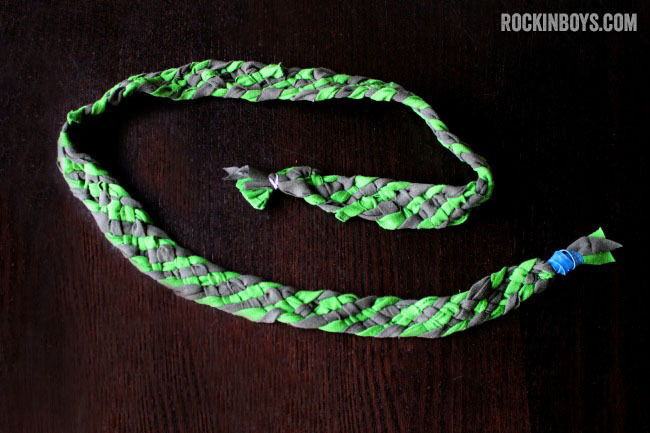 Once you’re done, wrap another rubber band, or rainbow loom band, around the end. Cut off excess. 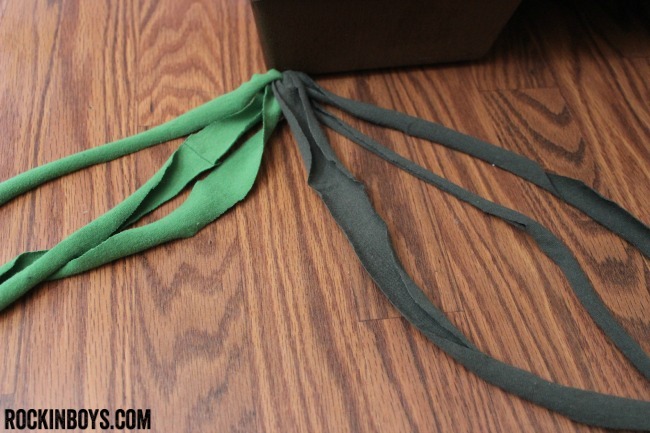 Place one side through the D-rings, and fold it over the flat part of the D. Leave the rubber band on and sew across the belt as close to the D-rings as you can. Sew a couple of lines across the other end to finish it off, and you’re done! You’ve got a new fashionable Earth-friendly belt! What a good idea! The belt is sweet. Thanks for the link. Thank you for the easy to follow tutorial and the kind words!